Alice Artzt, a disciple of Julian Bream, Ida Presti, and Alexandre Lagoya, began the guitar program at TCNJ over 40 years ago. It was subsequently directed by Robert Trent, and most recently led by James M. Day. 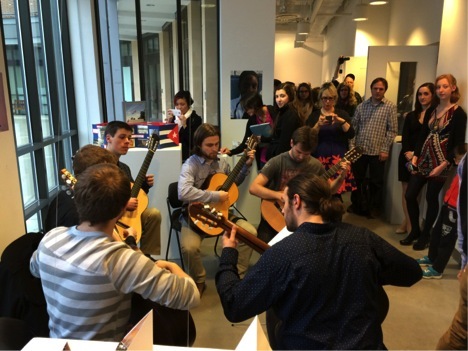 Guitar study at TCNJ includes studio instruction, pedagogy, techniques, literature, ensemble coaching, and community engagement. Guitar instruction is open to all students at TCNJ. TCNJ Guitar Ensemble most recently performed at the invitation of the Guitar Foundation of America Regional Symposium in New York City, the Fall Guitar Festival at State University of New York, Oneonta, and the Philadelphia International Guitar Festival.